Khun Mae usually recommend for Singaporeans to visit Kong Meng San located at Birshan area. From the vegetarian restaurant inside Kong Meng San, take the lift to the 4th floor and you would be able to see the magnificient Buddha seated in the hall. For the benefit of those who are able to visit Kong Meng San and would like to know how to go about paying respects and making aspirations, below is a short guide taken from Khun Mae’s advise to one of her followers. 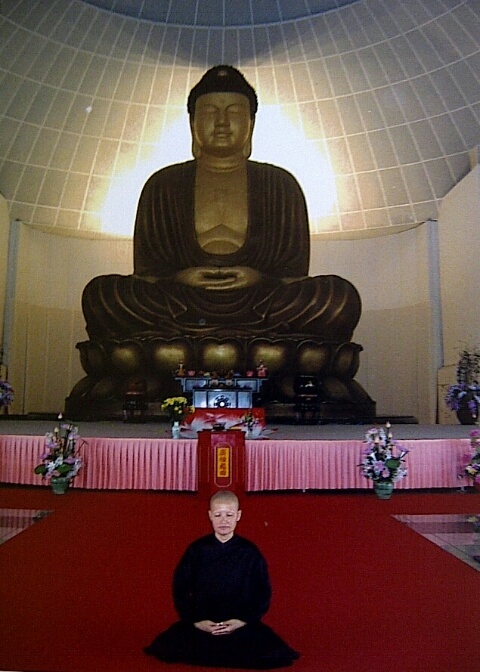 Khun Mae taught that we can invite the power of the Buddha to protect and help us. When arriving pay respect to the Buddha 3 times. Then circle the Buddha for 9 rounds in a clockwise direction. Upon completing each round- make aspiration… for example after the 4th round “may my merits be dedicated to my father out off gratitude”. You may also buy flowers to encircle the rounds and offer to the Buddha after completing the 9 rounds. Note: The photo of Khun Mae above was taken few years ago.